The First Inverse Theater Musical! 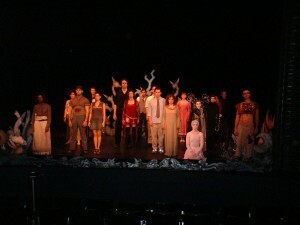 Inverse Theater will present Lost, a new musical loosely based on the Hansel and Gretel story. Performances will begin on August 9th, and will continue through August 25th at the New York International Fringe Festival (venue and schedule to be announced). Lost is a Hansel and Gretel upgrade in which the fairy tale format is transplanted and twisted into a fresh new form, containing real American myths and ghost stories, intensely modern situations and dilemmas, and troubling meditations on the way children are treated in present American society. Gabby and Hanlon, two teen-age siblings from the city, are abandoned by their father in the Great Smoky Mountains of Tennessee. They are then kidnapped by Mamba, an evil witch who farms children’s body parts to gain eternal life, and Laborius, her mad scientist husband. This evil twosome seduce the two terrified teens into a surreal secret hideaway where children from ages past live out their suspended lives bereft of the body parts they have lost to the organ-snatching Mamba. While there, Gabby and Hanlon each falls in love with a sad spirit, then make a failed attempt to escape through a forest of ax-wielding ghosts, only to at last be reconciled to going through the motions of preparing their organs for transplant (Gabby exercising to nurture her uterus and Hanlon studying to nurture his brain). However, after discovering that Mamba and Laborius are the last remaining remnants of the Lost Colony of Roanoke, Gabby and Hanlon finally break free by rousing the other children to revolt. At last they escape, still torn between their urge for home and their feelings of love and pity for the disembodied children. Like most of Mr. Bromley’s plays, Lost is written in vibrant, modern verse. It tackles deep and difficult issues while also maintaining a tone of entertaining humor and hysteria. The music, by Jessica Grace Wing, is composed in an eclectic style, using a mix of baroque, ambient techno, and blue-grass. Having studied at Stanford University, Ms. Wing is an exciting new composer whose work is both risky and melodic. Rob Urbinati, who is Artistic Director of Queens Theater in the Park, has directed nearly one hundred plays with The New Group, Pearl Theater, and Eric Bogosian, among many others. The sum total of these creators promises a musical that is both accessible and challenging, operatic and vaudevillian, macabre and uplifting. * These actors appeared courtesy of Actor’s Equity Association, Inc.